Having a job can be exciting, fun, hard work, scary, and full of new skills to learn and master. This is as true for young people with cognitive disabilities as it is for those with other disabilities or no disabilities at all. In the past, many people with disabilities didn’t have jobs. This was especially true for people with mental retardation and those with autism. Today, fortunately, the employment prospects for such individuals are changing (President’s Committee on Employment of People with Disabilities, 1997). 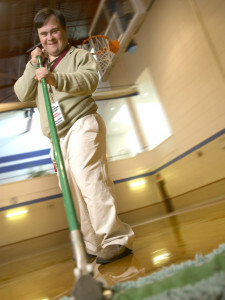 Young people with these disabilities are learning important skills in school and on the job. These skills are proving useful to employers, and so are the other talents that people with disabilities bring to the workplace. How do typical young people become employed? Most look in the help wanted ads or find out about job openings from friends or relatives. They may go to an interview, give their resume to the prospective employer, and, if all goes well and they have the skills necessary, they get the job. what type of disability they have. For youth with cognitive limitations, special employment challenges exist, so they are likely to need extensive support in finding and keeping a job. Any number of individuals can be involved in helping the young person find and keep a job. But the most important person to be involved is the young person! The young man or woman must be at the center of all employment considerations. He or she is the one who is going to be doing the job. Many people may give support, may supervise or provide training to the young person, and may invest their heart and soul in seeing that the young person succeeds, but the bottom line is that this is the young person’s job. Given that, it’s important to consider what the person is interested in. What is he or she good at? What are his or her support needs? What type of a work environment does the person prefer? These questions need to be answered when others are involved in helping the youth find a job that’s satisfying or, at the very least, is a learning experience upon which to build future opportunities. making connections with the adult service system. Rehabilitation counselors and job development specialists can be involved in a student’s transition planning while the student is still in school. The rehabilitation counselor typically works for the state’s vocational rehabilitation (VR) agency, helping people with disabilities prepare for and find employment. For students who are eligible for VR, a wide variety of services are available, including: evaluation of the person’s interests, capabilities, and limitations; job training; transportation; aids and devices; job placement; and job follow-up. helping to promote interaction between the employee and his or her co-workers (PACER Center, 1998). The key participant in the employment quest of the person with a disability is, of course, the employer. In the past, many businesses and organizations have been reluctant to hire people with disabilities, but in today’s marketplace, a great many employers are now discovering the benefits of doing so.